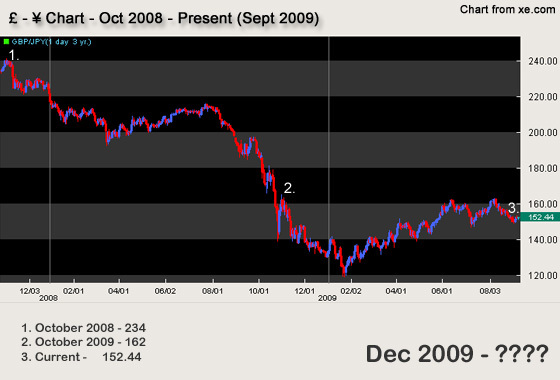 I’m focusing on particular date ranges – October 2008 & 2009 – the dates of my 2 holidays to Japan when I can directly relate to the exchange rate. October 2007 was pretty much the norm, £1 getting you around ¥235. For comparison your standard soft drink from a vending machine costs between ¥130 – ¥160 (54p – 67p) depending on size. At this rate everything from eating out to buying Gunpla felt very reasonable. October 2009 up until present day were a very different story. I remember the exchange rate started crashing about a couple of months before I flew out – just as I was starting to really look forward to it and it really put a dampner on the excitement, culimating in me feverishly watching the stock indexes and realtime rates online. By the time we actually flew out it was sitting at around ¥162(down 32%), those drinks last year now cost 80p and 99p, round that up for things like meals, train tickets and entry to places and it comes to one hell of a difference. In the end we just had to say ‘sod it’ and not let it ruin our holiday and just worry about the money situation on our return. Now with the Wedding coming up in less than 4 months my eyes are jumping back to the exchange rate again, which currently stands at a horrible ¥152.44..
Has the global recession affected anyones travel plans to Japan or anywhere else in the world? and if you’ve been recently how far did your money go? While I was in Japan in Nov/Dec 08 for over a month, while I was over there the ex rate dropped, but I didn’t know and merrily went to an international cash machine and withdrew a few 10,000Ynotes..a couple of times…didn’t realise about the exchange rate until I got back to England, looked at my online statement and went WHAT?!!? Shocking isn’t it! I never thought it’d get as low as it has… pretty much every travel guide to japan quotes £ – ¥ as 220ish which shows how truly out of the ordinary this situation is! well as someone who lives in japan i have to say that this year has been amazing for me. in this year alone because of the exchange rates ive almost completely eliminated YEARS of debt by sending money back home at these insane rates. bad for you. awesome for me. love your ‘kizuna’ profile pic btw. i might just steal your idea! Woah Busterbeams on my blog! welcome! Great to hear it’s not causing misery for everyone, 2 sides to every coin I guess and hope it doesn’t seem i’m just focusing on the negative! I can deal with poor rates when buying Gunpla and other small items, but the Weddings in Kyoto is costing us thousands more than when booked and that’s a bit of a bugger! Glad you like the Kizuna pic 🙂 I luuurve that game, my pilot card has pride of place in my wallet ready to be used again!